Stephanie Rische was starting to feel invisible. All around her, her friends were getting married, and she found herself decidedly alone. Stephanie couldn?t help but wonder if there was something broken in her?was she not pretty enough? Not fun enough? Not dateable enough (whatever that meant)? So she started praying in earnest for God to bring the right man into her life. And instead, He brought her matchmakers. Eight of them, to be precise. Beloved blogger Stephanie Rische debuts with this charming, vulnerable, and (who are we kidding?) often mortifying true story of a girl who tried really hard to find someone to fall in love with?even when she mostly just ended up falling flat on her face. But amid the most cringeworthy setups and awkward encounters, Stephanie found God's grace and love meeting her there in ways she never could have imagined?once she opened her eyes to see. 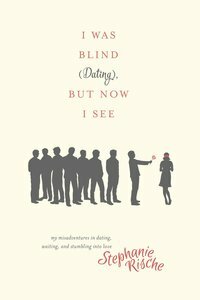 About "I Was Blind , But Now I See (Dating)"
Customer Reviews For "I Was Blind , But Now I See (Dating)"
This book is just fabulous! Stephanie writes about her personal spiritual discoveries whilst living the single life. Beautiful insights into journeying with God and intelligent wit make this book lovely to read!